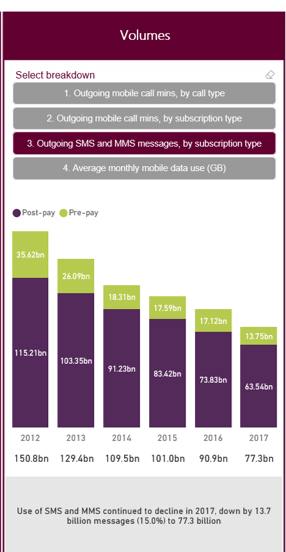 The experience of messaging apps may be superior when handling rich features, but it needs internet connection, and it consumes data, which is exactly what operators are working hard to monetise. Some choose to offer bigger data buckets at a higher price, while others bundled with value-added services, for example video streaming. The result shows people do pick up higher packages. The total mobile retail revenues dropped by 1.3% from 2016, but revenues from mobile packages grew by nearly 3%, while revenues from out-of-bundle data near held. The biggest drop occurred in out-of-bundle voice. It seems for most people the bundled voice was already more than enough.